I begin 2012 with a wonderful Zwartbles true story. fields. The ram made his way onto a neighbour’s farm where he came across a small flock of mule ewes. As shepherds know, a mule ewe is a cross between a Bluefaced Leicester ram, and an upland or hill ewe. The ram managed to do his business before he was caught by the very angry owner of the Mule ewes. Now this farmer didn’t think much of the resulting black lambs so he tried to get this blemish of the Zwartbles breeding off his farm as soon as possible. He brought the ewe lambs as weanling’s only 4 months old to the Ballinasloe Mart in October 2011. There were 6 black Zwartbles X Mule ewe lambs in the pen. Spectators watched bidding for the lambs go up and up and up till the hammer fell at €182.50 per lamb. At the final crack of the hammer, there was a spontaneous round of applause as this was an outstanding price on the day for replacement ewe lambs who only made an average of €100 per lamb. The angry farmer became a very happy farmer. He wanted to buy a Zwartbles ram the very next day as did quite a few other farmers who witnessed this event. 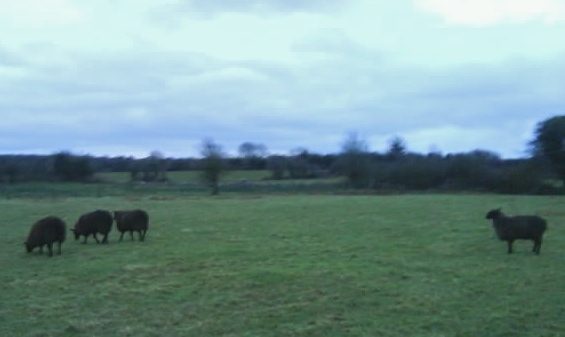 “Sorry”, said the Zwartbles breeder whose wandering randy ram had caused such a stir, “I am all sold out this year”. Is there a moral to this true lambs’ tale or perhaps even a parable? Happy New Year! May your lambing go well!!! 2 Responses to A Zwartbles Ram Triumph.